Susan, an active mother of three, woke up the day after taking a one-hour flight with a swollen, painful leg that was almost purple. She knew something was wrong, but didn’t expect what the emergency room doctors told her—that a deep vein thrombosis (DVT) blood clot from her ankle to just below her belly button might prevent her from walking again. Luckily for Susan, she was able to choose a minimally invasive thrombectomy procedure to break up and remove the clot, and help reduce her risk for future complications. Within a week, she was climbing stairs on her own and well on her way back to gardening and canoeing with her family. It seems like common sense to invest as aggressively as possible in these jobs and technologies. But the federal medical device tax threatens that investment. In 2013, a new tax was imposed on the medical device industry. This 2.3 percent medical device tax is imposed on revenue—not profits—at the cost of investment in jobs and innovation. When it was introduced, many device manufacturers faced difficult choices that would impact headcount or reduce investment in research and development. For companies like Boston Scientific that produce life-changing products from pacemakers and defibrillators to pain management platforms to the thrombectomy device that changed Susan’s life, it was a challenging time. Department of Commerce data shows that the industry lost nearly 29,000 jobs during the three years that the tax was enforced, and the opportunity costs of lost R&D are harder to quantify. In 2015, Congressional champions on both sides of the aisle led a successful push to suspend the tax for two years, allowing companies like Boston Scientific to reinvest millions of dollars into research and development and hire new workers. What does that investment look like? Through projects with leading medical facilities, we have been able to combine our manufacturing expertise with novel ideas from physicians to develop products that address unmet clinical needs. For example, a collaboration with the Mayo Clinic has allowed us to cultivate innovations designed to advance patient care, like studying the use of our Spinal Cord Stimulator system to help patients with heart failure continue to exercise. Thanks in large part to Rep. Erik Paulsen’s leadership in the House and Sen. Amy Klobuchar’s in the Senate, the device tax was suspended again this past January. The suspension allows us to plan for continued investment in these innovative programs in the near-term—but it doesn’t grant us the stability we need to develop long-term strategies and budgets that maximize innovation and translate into more stories like Susan’s all over the country. As we develop our future business plans, the looming return of the device tax limits the amount we will be able to invest in innovation. This on top of the wasted dollars and time spent just to have a compliant system for reporting the tax, only to have it change again. 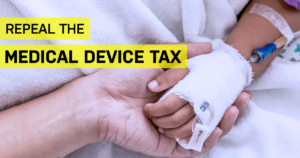 With widespread bipartisan support, House Resolution 184, the Protect Medical Innovation Act would repeal the burdensome medical device tax once and for all. Patients like Susan are waiting for the next breakthrough—let’s do everything we can to deliver it sooner.